Are you looking for a more holistic and natural approach to your pet's care? 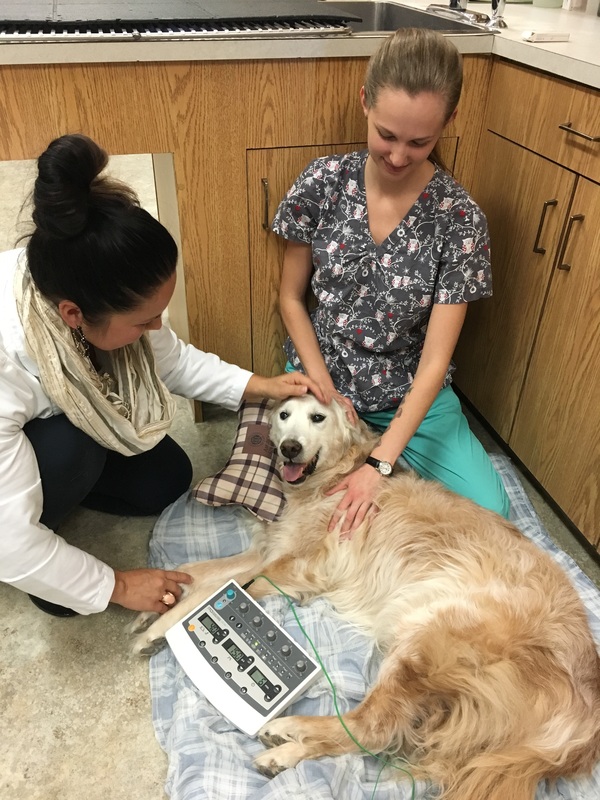 At Wascana Animal Hospital, Dr. Ulmer is pleased to provide traditional Chinese veterinary medical (TCVM) examinations and alternative treatment modalities such as acupuncture to her Regina and surrounding area patients. Acupuncture has existed for thousands of years as a holistic treatment modality. TCVM examinations and acupuncture are based around evaluating the patient as a whole. We look at multiple facets of your pet's lifestyle in addition to their presenting concern (ex: what diet they are being fed, what temperatures they prefer, specific behaviors they have at home). Acupuncture therapy works by restoring the balance of Yin and Yang in the body; draining excesses and tonifying deficiencies. Acupuncture is effective for a variety of acute and chronic medical conditions. Sometimes acupuncture therapy can be used as the sole form of treatment in our patients, other times we may combine it with conventional medications or even Chinese Veterinary herbal therapies. Dr. Ulmer is a certified veterinary acupuncturist (CVA) who received her training through the International Veterinary Acupuncture Society (IVAS). She practices integrative medicine by offering alternative treatment options and therapies, when indicated, in conjunction with conventional (western) medical treatment. This allows her to help support your pet's health to the fullest, and to maximize the potential for a successful outcome. Acupuncture therapy is generally tolerated very well by our pet family members! For the majority of our patients, we like to have the pet owner remain with them while they are receiving acupuncture treatment. This minimizes stress and allows our patients to rest calmly with their owners during treatment. Soft music and dim lighting are also offered to aid with relaxation if preferred. Acupuncture treatments often last for 10-15 minutes. Most pets are so relaxed during their treatment that they aren't ready to get up and go home! The number of treatments needed and the interval time between treatments varies depending on the condition. Acupuncture treatment can include dry-needling (needles placed through the skin), electrostimulation (a low dose of electrical current passed between acupuncture needles placed through the skin), as well as aquapuncture (where a small amount of liquid is injected into the acupuncture points). Acupuncture is effective for many musculoskeletal & neurological conditions such as intervertebral disk disease (IVDD), repetitive strain injuries common in working or agility dogs, torn/damaged ligaments & tendons, nerve paralysis, and bone abnormalities (arthritis, bone cysts etc). Many other medical, behavioural and dermatological conditions also respond well to acupuncture therapy. Acupuncture may allow a patient to reduce, and in some cases even discontinue, the amount of antibiotic, steroid, pain control or other medications they require. We see a lot of senior pets that may be struggling with arthritis or other chronic pain issues. Acupuncture can be very helpful in supporting these animals and is easily combined with conventional treatments. If you have questions about whether or not acupuncture therapy may benefit your pet's condition, please schedule a consultation with Dr. Ulmer by calling us at 306-789-0918. Dr. Ulmer placing needles in a canine patient. This patient is receiving electroacupuncture to help improve the mobility and strength in both hindlimbs. Many senior large breed dogs may have "splaying" of back legs, slipping or knuckling of the paws which can be improved with acupuncture treatment.